Or Does Your Child Get Teased At School Because They Stutter And Can’t Speak Like Everyone Else? So people that stutter end up feeling left out and alone. People don’t want to take the time to listen to what they have to say because they take too long to get their words out. Not only do they not want to be patient, but they are not interested in socializing with people that have this speech disorder. This causes the person with the stuttering problem to feel rejected. It can also have a negative effect on their self-esteem and confidence. They try so much to talk normal, but to no avail. It doesn’t help when they take a few minutes to pronounce a word that people with normal speech can say in a matter of seconds. How about sitting at the table with other family members and not being able to talk fluently like everyone else? They could sit around and hold a conversation about the day’s events and when it came time to ask you a question or get your input, all you could do was nervously stammer and force yourself to get the words out. There was too much pressure for you to say what you need to without talking too fast and stumbling. What an embarrassing andunfortunate situation for you. Sometimes you even wondered if your family was able to understand what you were trying to convey. You don’t have to stay in this dilemma. There are ways that you can overcome your stumbling and bumbling when you stutter. I’m not kidding, you can overcome this speech disorder and start talking normally! Now you’re probably wondering how…. 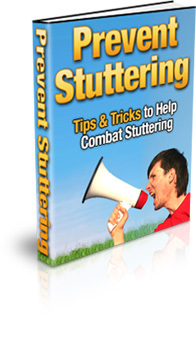 When you get this guide, Prevent Stuttering (Tips & Tricks to Help Combat Stuttering), you will have all the information you need to begin your road to recovery. This book is filled with tips and strategies to help you reach your goal of speaking clearly and fluently.